Although the dining space of Sushi & Roll is one of the largest among the sushi restaurants in town, it was still almost full when we got there. 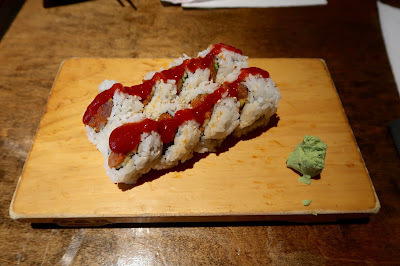 Since I already have a blog post about Sushi & Roll from before, I ordered a few things I haven't blogged about yet. How could I not order seared nigiri when it is for less than $2 a piece? 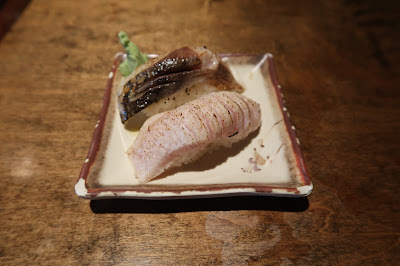 The Seared Saba Nigiri was very juicy and melty, to a point where it almost felt unnatural. I highly enjoyed the nice smoky flavour though. The Seared Toro Nigiri came with the same excellent smoky flavour, but parts of it were a bit dry. Joanna had the Spicy Tuna Roll, which was nicely accented by sesame seeds and came with soft tuna. It would be nice to see the hot chili sauce integrated into the roll a bit better instead of just being piled on top. 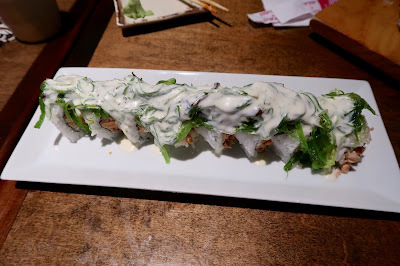 For my special roll, I had the Snow Angel Roll, which consisted of stir-fried salmon, wakame, and creamy sauce. The sheer amount of thick, creamy sauce on top made this roll look more like the Calories of Doom Roll than a Snow Angel Roll. However, to my surprise, the sauce actually worked well with the seaweed and the flaky, rich salmon inside. The wakame formed a net on top rather than separating nicely with the individual pieces of the roll, so grabbing one piece of the roll could potentially cause another piece to fall apart. 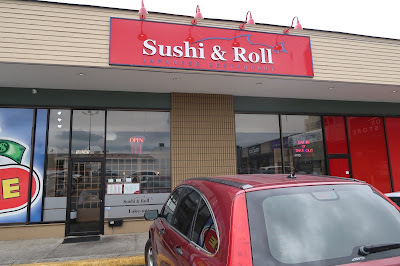 Other than that, if you can get past the thick sauce, the flavours of the roll were decent. Yes, we have already come to the end of this post. Did Joanna eat next to nothing? Did I finally decide to eat as much as a normal person even when there's sushi on the table? Nope. They forgot to place in two of my appetizers! It seems like I'm on a streak, as something similar happened in the previous episode as well. They were apologetic about it, but unfortunately, we couldn't stay any longer to wait for the missing dishes to arrive. I really needed my calories though, so we went to the nearby Chatime to fill ourselves up. WOAH, I've never seen a sushi roll bathed in so much sauce!! LOL neither have I! It didn't really make the roll look very appetizing. I was hesitant to eat it at first. I was simply amazed at the architecture of this absolutely beautiful venue!! The environment of the lofty spaces was unbelievable. I was fortunate enough to visit a place like this, we found awesome things one after another after another.